As you know, I love the incredible, edible egg. I was flipping through an omelette book the other day and this clipping from London's The Observer fell out. I love finding things in old books. Well, Len Deighton, the famous mystery writer was also a bit of a cooking expert and a mighty fine illustrator. So, long before there were "graphic novels" Deighton did a graphic cookbook. Well, two actually, based on his cook strips for The Observer. Wait, actually, his most famous of these "cook strip" collection, Action Cook Book, has been reprinted in England. Perhaps it will soon be available in the U.S. He also wrote two excellent books on French cooking - one called the ABC of French Cookery - having spent time as a younger man working in kitchens in Paris. 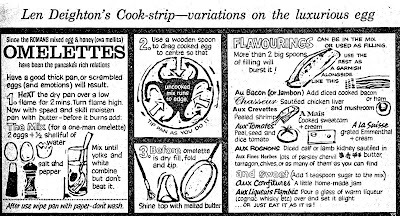 Very much a gourmet at a time in sixties London when most men didn't cook. Yum! Deighton's instructions are simple and straight-forward. I'll have to track this book down!